2001 September 11 9:33 AM: American Airlines Flight 77 makes a radical 270-degree turn to avoid striking the front of the Pentagon, where Rumsfeld and the Joint Chiefs reside, and strikes a relatively uninhabited and recently reinforced section of the Pentagon occupied by accountants and investigators. It was allegedly a Boeing 757-200. Mystery object: The plane that hit the Pentagon isn't seen in any photographs. Some ask if it existed at all, including French analysts who determined that at least two frames are missing from the Pentagon video. A subsequent analysis supports the crash of a Boeing 757-200-removed by introducing the fact that much of its wing is made from carbon fiber. Why not publish the serial numbers of recovered aircraft parts to confirm it was Flight 77? 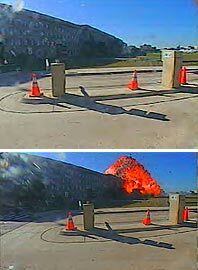 Within minutes of the blast, all security camera tapes are immediately confiscated from a Nexcom/Citco gas station (open only to Department of Defense personnel) and a Double Tree Inn, and presumably all six Pentagon cameras with a view of the scene. Why not publish all the tapes? Here is a list of all the videos. Yes, the Pentagon explosion is curious, but the disappearance of Flight 77 and the silence of the clean-up crew at the Pentagon require a larger conspiracy than the few Securacom personnel employed by the Bush brothers and a cousin for seven years to prepare the WTC buildings for demolition. Even without transponders to easily identify aircraft, radar is used to track aircraft, so no radar contact from Ohio to the Pentagon is curious, and there is some evidence that Flight 77 was not scheduled to fly and did not fly that day, but focus on WTC1, 2, and 7. The molten steel seen pouring from WTC 2, and reported in the basements of 1, 2, and 7, sulfur and thermate residue, unburned thermate in WTC dust, etc. is unequivocal evidence of the demolition of the WTC 1, 2, and 7. Like the battle ships of Pearl Harbor, WTC 1 and 2 were due for the scrap yard. They were unprofitable, and dissimilar metal corrosion problems discovered in 1977 required they be dismantled before 2007. Only the flaps, slats, rudders and landing gear doors of a Boeing 757 are made of composite material, which tends to fluff when damaged. If the engines were Rolls Royce, the fan blades may have been made of composite material, but the engine supports, turbine blades and many of the other engine components and landing gear were titanium, and most of the structure was aluminum, so the lack of debris near the 16' diameter hole in the reinforced concrete structure is curious, as is the lack of damage to the windows and face of the building. Penetrating the aluminum clad steel exterior wall and open space of the Towers was relatively easy, but how could a lightweight aluminum structure penetrate six reinforced concrete walls to the center of the Pentagon? Army Major General Albert "Bert" N. Stubblebine III was responsible for all Army intelligence. After he retired, he had an interview with German television in which he said he was convenced an aircraft did not strike the Pentagon, because he found no evidence of wing marks on the Pentagon. He was told that one wing broke off. OK, but most airplanes have two wings. He also says it is clear that the WTC buildings did not collapse due to their injuries. With regard to the Pentagon's claim that one wing broke off, where is a mark on the grass indicating a wing impact? Where is the wing and its engine? The government claims the wings and engines neatly folded along the sides of the aircraft, so the entire airplane could enter the building through the small entry hole. (The large hole shown by the media was after the collapse of the building.) The problem with that explanation is that aircraft wings are designed to shear from the fusealage during an impact to distance the fuel in the wings from the passengers in the fuselage. The few photos provided by the Pentagon did not clearly show an aircraft, but did reveal a white exhaust track like that of a missile. Fan jet engines do no have a white smoke exhaust or leave contrails at low altitude. The contrails seen high in the sky are due to ice crystals from water from the exhaust suddenly freezing at high altitude. At least two of the frames from that video are missing. Where are the photos from the other Pentagon security cameras, particularly those with a view unobstructed by parking lot equipment? Where are the gas station security camera videos seized by government agents? The video from one hotel security camera was finally released, but the view of that camera was obstructed such that it could only see the cloud from the explosion, which was much smaller than that of the aircraft the struck the WTC Towers. Why did the 'terrorists' select a newly reinforced and relatively unoccupied portion of the Pentagon rather than the offices of the Secretary of Defense and Joint Chiefs? What was so important about some accountants who were auditing DoD spending? Why did they report the oder of high-yield military explosives? Anyone ever learn what was under the large blue tarp that was hand-carried from the pentagon by a dozen or so men? Why were the serial numbers on all the aircraft debris not compared with those of record for the aircraft involved? More questions than answers. 911 won't be resolved until 911-Truth and other critics are given subpoena authority. Did Flight 77 really hit the Pentagon on 911 (Part One)? Did Flight 77 really crash into the Pentagon? 2004 October 14: Original Flight77.info FOIA request for Double Tree Inn security video.